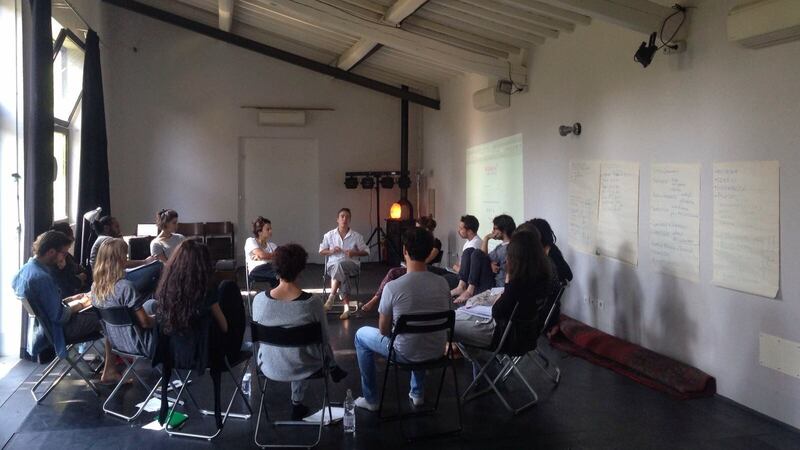 In the frame of the European project “Routes to Employment”, 16 young artists aspiring to become professional cultural entrepreneurs were trained in Florence. Among the 42 applications received, 16 young artists aspiring to become professional cultural entrepreneurs were selected (dancers, musicians, performers, visual and multimedia artists). They participated to the educational programme coordinated by Pietro Gaglianò, Caterina Poggesi, Cesare Torricelli and Marina Bistolfi. The intensive path of non-formal education is based on practices of sharing and participation, and aims at providing skills and methods for the participants’ professional growth. The goal is to facilitate access to entrepreneurial skills that are essential to young artists in the critical passage from education to profession (from elements of administration to tools for self-promotion), in the perspective of an organic and multidisciplinary vision attentive to contemporary demands, also declined in terms of social, economic, political and pedagogical understanding. The synthesis of the professional profile that emerges is characterized by interdisciplinary and intercultural sensitivity, and awareness of the role of the artist in terms of responsibility and professional ethics. The main area, to which all afternoons were dedicated, was a true laboratory of ideas, where all the steps of an artistic project were experimented, from its conception to the development, production, promotion. The participants, divided into groups, were enabled to verify on the basis of projects actually in place or to be made, the skills and information acquired and developed within the other modules. Specific modules conducted by professional experts focused on management, communication, profiling, and on building portfolios and other instruments of promotion of an artist’s work. Some specialized master classes tackled more broadly the connections between business and autonomy of artistic careers.